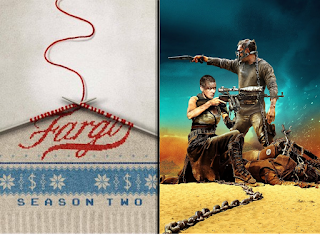 This year I've found myself branching out a little more on this blog, writing weekly responses to individual television episodes rather than simply writing about whichever films I'd seen lately. I had a great time with it, and soon discovered that I enjoyed writing about television just as much as I enjoyed writing about film. Having already compiled and posted my list of the best films of this year, I thought it would be good to also go a little more in depth about my views on what 2015 had to offer in terms of television. To make it easier, I went ahead and broke the "Film" and "Television" categories into much smaller options so, without further ado, here is the best, worst and weirdest of 2015. Best Film - Mad Max: Fury Road - I've already discussed why Fury Road is the best film of this year over on my, erm, The Best Films of This Year article, found here. I'll summarise it briefly. Seamless world building, powerful characterization, breathtaking visual effects, interesting gender politics, award calibre acting, stunning cinematography, exhilarating action, intimate scope and effective storytelling. It just doesn't get much better than this, folks. Worst Film - Poltergeist - Acting as a remake of the identically titled 1982 horror film, the latest Poltergeist not only failed to offer anything exciting to the currently reinvigorated genre but totally blundered almost everything even the most mundane of horror films manage to get right. There was some dazzling special effects on display here, but they could not save this remake from its own tepid script, wooden acting and total lack of real horror content. Most Surprising Film - Jurassic World - This is one of those films that had every right to be a disaster. Was Jurassic World a great film? Not really. It has its moments, and it's perfectly enjoyable, but there's still some sketchy characterization and the fact that, in close up, the dinosaurs look worse here than they did in the original twenty odd years ago. Chris Pratt's likable performance boosts things though, and that, along with the sense of nostalgia and modernity that the film seamlessly combines, made Jurassic World the most surprisingly enjoyable cinema experience in quite a while. Most Disappointing Film - The Good Dinosaur - Pixar have such a heavy crown on their head that whenever they offer anything below par it feels extremely disappointing. The Good Dinosaur, though, felt different. Unlike either of the Cars films, this story had true potential, but seriously messed up on two of Pixar's key traits: clever storytelling and great humour. There are some good bursts here and there, but ultimately The Good Dinosaur just couldn't live up to its own expectations of itself. 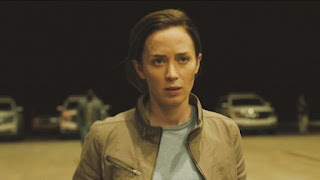 Best Film Performance - Emily Blunt (Sicario) - There are an abundance of excellent performances that I could have written about here, but when I really thought back to which character and which performer hit me hardest this year, Emily Blunt's turn in Sicario nudged its way to the front. Blunt's character alone smashes the female archetype that many action thrillers get wrong, but Blunt elevates this even more. She tells the story of Kate's life with just her eyes, expresses her sorrow in just her breathing. Blunt had a great deal to live up to with Sicario's script being as excellent as it is, but not only did she match that quality, she exceeded it. 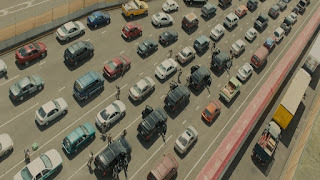 Best Film Scene - Final Chase (Mad Max: Fury Road) - It could be argued that Fury Road can't really be broken down into scenes: the film is, after all, almost shown in real time. Yet the final chase sequence in this fourth Mad Max entry is so exhilarating, so utterly utterly brilliant that I couldn't even consider anything else taking this spot. Every ounce of character development that the film builds in its first two acts is placed at stake come the final chase, and even if the story itself is simple (impressively so) the film making certainly is not. Every frame, every pixel comes together with cinematic perfection. This is film making at its most bravura. Most Intense Moment - Bridge Shootout (Sicario) - There are a shed load of scenes that crossed my mind for this, half of them from Sicario alone. But the sheer simplicity of this sequence is what steals it. It is just a shootout on a bridge, yet it has the capacity to silence even the most steady-handed viewer. It's a frustratingly short scene, but had it lasted any longer I fear viewers would be forced into cardiac arrest. In a film packed with ridiculously intense moments, this one truly stands out as the best. Saddest Moment - Bye Bye Bing Bong (Inside Out) - Earlier we discussed Pixar when they disappoint. Now, we can discuss Pixar when they excel. Inside Out was Pixar's best feature yet, loaded with emotion, humour, intricate design work and wonderful innovation. But when poor, kind spirited Bing Bong sacrificed himself to allow Joy to return to Riley's HQ, Pixar landed one of their most emotional moments yet. Children and parents alike shed tears as he faded away forever - "Take her to the moon for me". Funniest Moment - GIRL. GIRL. GIRL. 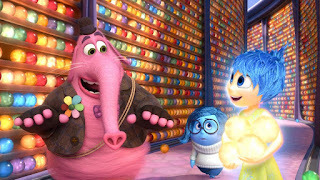 (Inside Out) - How apt it is that not only does Pixar occupy both Saddest and Funniest moment on this list, but that they did it with the same film. After a whirlwind of drama, emotion and comedy, Inside Out reached a touching and poignant conclusion, before allowing us a brief glimpse into Riley's near future. As Riley bumps into a boy, we soar into his mind, only to see his emotions running wild - literally. His versions of Joy, Anger, Disgust, Fear and Sadness are all screaming and charging around the place, while the control system goes haywire and red warning signs reading "GIRL" flash around the screen with sirens. It's entirely unexpected, brilliantly conceived, perfectly executed and utterly hilarious. Weirdest Moment - Attack of the Naked, Urinating Woman (It Follows) - Back in February when it released, It Follows was the best horror film to hit cinemas in a very long time. It had great cinematography, sharp writing, intricate characters and an abundance of memorable scares. In the middle of the film, Jay suddenly sees "It" in the kitchen of her house, as "It" takes on the form of a blood soaked woman, clothes torn, half naked, slowly trudging towards her. She's also urinating all over the floor. If horror is all about catching the viewer off guard, this scene achieves it with ease. It's either bloody brilliant or bloody awful, and I don't think I'll ever know for sure. Special Mention - Star Wars: The Force Awakens - I couldn't find it a specific place on this list, but how could I discuss 2015 in film without reference to Star Wars. It's already grossed over $1bn in just nine days, but we all saw that coming, didn't we? After over a decade since the last live action entry to the Star Wars saga, The Force Awakens hit screens last month, delivering on phenomenal fan expectations. Yet, even when stripped of its in-jokes and nostalgia, J.J. Abrams has constructed an engaging, compelling piece of science fiction that understands how vital effective storytelling and layered characters are to the genre. It isn't entirely perfect, but it isn't far off. Best TV Series - Fargo (Season 2) - In this currently dubbed "Golden Era" of TV, one show this year surpassed anything I've seen in a very long time. 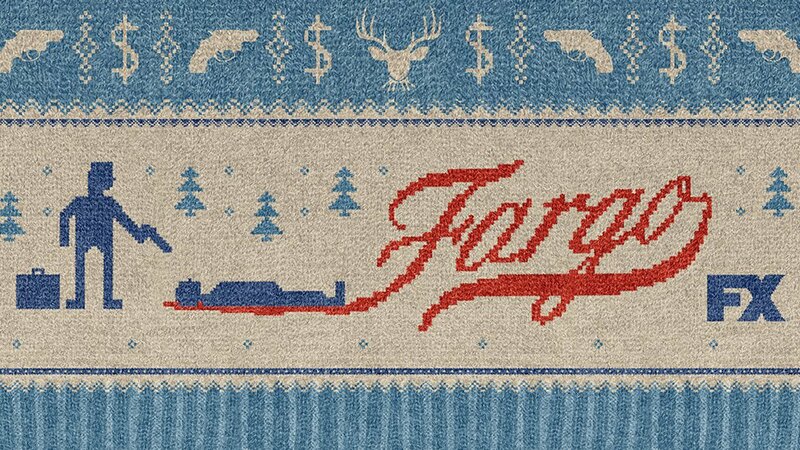 Fargo's first season was bold, exciting television, using its absurd touch and wacky cinematography to set it apart from other US dramas. In an age where anthology shows are routinely unreliable (American Horror Story can never find a consistent quality, while True Detective dipped considerably in its second year), Fargo broke the mold by offering a supremely superb run of episodes that soared far beyond the quality we saw in its first year. These characters were wonderfully detailed, with exceptionally layered writing allowing for innovative and exciting storytelling. The cinematography stepped up its game too, with some bizarre yet entirely successful risks taken across season two, and Fargo's trademark weirdness was molded into the story more seamlessly. Creator Noah Hawley took everything that worked in year one and boosted it in year two, while simultaneously ironing out anything that needed fixing. It is, genuinely, one of the best seasons of television I have ever seen. An absolute triumph. Best TV Episode - "Heaven Sent" - Doctor Who - Much like Fargo, Doctor Who improved supremely from an already stellar previous series. After an already great run, the show's ninth series headed into its finale with an episode unlike any it had previously attempted. 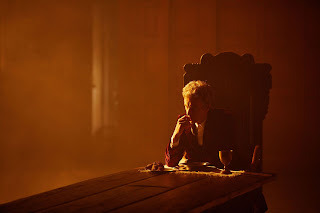 Almost entirely devoid of a cast beyond Peter Capaldi, we watched the show discuss grief and psychology with a depth it never had before, whilst showing us unprecedented visual metaphors of the Doctor's mentality. 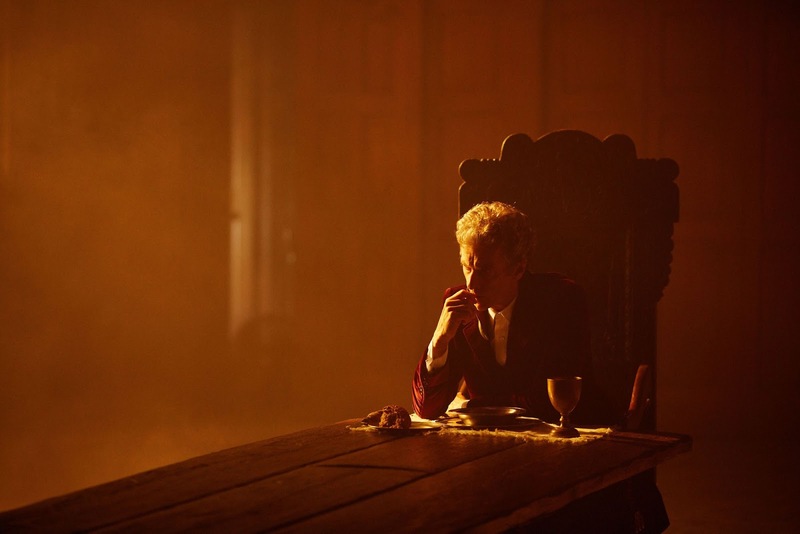 Capaldi's acting and Steven Moffat's writing hit top form, and so did Doctor Who. What a way to start wrapping up your best series to date, huh? Most Surprising TV Series - Marvel's Agent Carter - Marvel as a film production company are beginning to slack lately. All of their smaller film productions come across as inferior, and I began believing that Marvel could only work when they went big. Yet here they offered a small budgeted, character driven story on Peggy Carter set in 1940s New York and it is quite possibly the best thing the studio have ever done. Hayley Atwell was wonderful as Carter, surrounded by a game supporting cast that really allow the script's subtle comments on gender politics to flourish. The show found a tone in its first episode and stuck with it through to the very end, creating a consistently excellent season that surpassed anything Marvel had made prior to it. Season two begins in early 2016, and if it's anywhere near this standard then maybe, just maybe, Marvel will have their groove back. Most Disappointing TV Series - True Detective (Season 2) - Unlike Fargo, which bettered itself supremely in its second year, True Detective just couldn't live up to its own standard. The show's first season was dark, excellently well paced, intensely performed and refreshingly driven by character. Yet, for some bizarre reason, the decision was made for season two to drop all that made season one so exciting and just become...normal. We lost the poetic dialogue pieces, the abstract scenery, the symbolic cinematography. We just got a standard cop show. True Detective's second season was by no means bad, in fact its final three episodes were pretty excellent, but after a consistently rewarding first year this all felt far too tame to sit under the the title of True Detective. The show is bringing forth a third season later this year, so hopefully it will return to what made the first run so invigorating, and ignore the disappointment of season two. 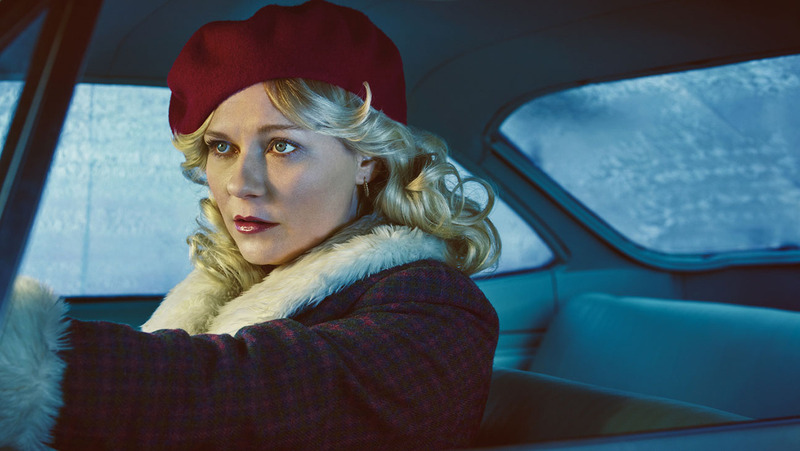 Best TV Performance - Kirsten Dunst - Fargo - To be entirely honest, there are a handful of performers from Fargo that could have taken this crown, but none would be more deserving than Kirsten Dunst. Peggy Blumquist is the delirious heart and soul of Fargo's second season, unintentionally thrusted into a world of violence and mob war when all she ever wanted in life was to better herself, to become "the best me I can be". Over the course of the season Peggy's mental state deteriorates rapidly, yet she is oblivious to it all, consistently clinging on to the hope that, one day, she will be the best me she can be. Her conclusion to the series was devastating, an emotional farewell to caring husband Ed as he dies in her arms followed by a heartbreaking interpretation of her own life in the back of a police car, and Dunst sold every moment entirely. Peggy's character is not an easy one to portray but Dunst treated us to the performance of her career here, and Fargo's second season was boosted even more. Best TV Scene - The Battle of Hardhome ("Hardhome" - Game of Thrones) - This wasn't Game of Thrones' best year, we all know that, but after seven meandering episodes the show finally returned to its adrenaline fueled, blood soaked roots with Hardhome. Unquestionably one of the most brutal sequences the show has ever done, Game of Thrones defied its own expectations with a battle that forced two rival tribes into co-operation in order to fight against the White Walkers. The lives of important characters were all genuinely at stake thanks to the show's reputation, and new characters who had barely minutes of screen time felt seriously well developed. At the same time, it was a feast for the eyes, as the show seamlessly combined practical shooting techniques with A-grade special effects, allowing this fictional world to feel somehow more real. Many began speculating that Game of Thrones was beginning to stumble, but Hardhome proved that this show still has countless tricks up its sleeve, ready to drop on its audience in a heartbeat. 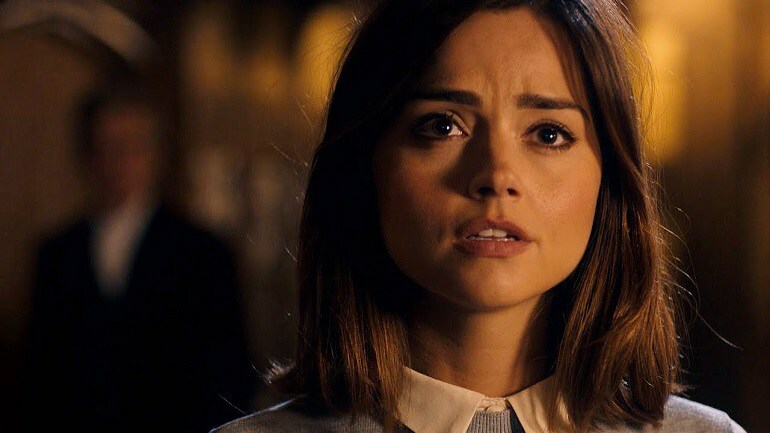 Saddest Moment - Clara's Goodbye ("Face the Raven" - Doctor Who) - After a poor start Clara Oswald developed wonderfully across Doctor Who's eighth and ninth series', becoming a character I genuinely cared for. Jenna Coleman was excellent, really understanding who Clara is and how her mind works, and it all lead to a heartbreaking end in Face the Raven. Clara came back, in a way, in the series finale, but the genius of that episode is that it doesn't undo the emotional farewell she was given here. As she ultimately causes her own demise, she bids the Doctor a tearful goodbye while he tells her he can't undo what she has done, before she walks outside into the Trap Street and faces the raven head on. Clara's development across the two years came full circle, and for the first time ever we watch as a companion falls lifelessly to the floor, and dies. For a character that I really disliked at first, I never expected to be as upset as this to watch her leave. Jenna Coleman, how wonderful you were. Funniest Moment - Hostage Fun ("Loplop" - Fargo) - It's an enormous testament to Fargo's scripting that the show can range from scenes of extreme intensity to one of the funniest episodes of television I've seen all year without anyone batting an eyelid. 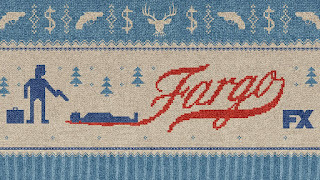 Fargo's first season had its fair share of comedy, but nothing to the standard of Loplop. 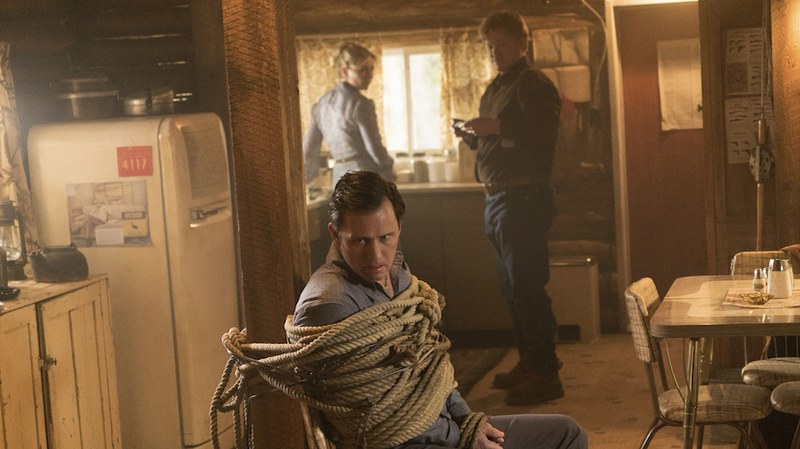 Peggy and Ed Blumquist held Dodd Gerhardt hostage in a remote cabin in the woods, and they soon come across as the world's worst kidnappers. Peggy asks Dodd if he wants beans, he says no. She makes him beans anyway, then remembers he didn't want beans. But she feeds him the beans, I mean, why wouldn't she? She also becomes so engrossed in the film she's watching that she doesn't notice him escape, and it isn't long before her husband is hanging from the ceiling, seconds away from suffocation. Loplop didn't cover a huge amount of plot, but its comedic beats kept the episode more than afloat. It might even be my favourite episode of the season, it is very very funny. Weirdest Moment - The U.F.O. ("Waiting for Dutch" and "The Castle" - Fargo) - Come the conclusion of the Sioux Falls Massacre, an enormous U.F.O appears in the sky as Bear Gerhardt throttles Lou Solverson, giving the latter just enough time to reach for his gun and shoot the former in the head, saving his own life. The U.F.O was seen briefly in opening episode Waiting for Dutch, but then never discussed again besides the odd "We Are Not Alone" bumper sticker or the occasional strange symbol in the background. The U.F.O is central to the season's story, though, after all had the U.F.O not caught the eye of Rye Gerhardt back in episode one, he would have never stepped back into the road and been hit by Peggy Blumquist's car, and the whole story would never exist. Yet the show is insistent on never explaining it. We get no answers as to why 1979 Minnesota is plagued by a U.F.O. As Peggy Blumquist herself says upon seeing it for the first, "Come on Ed, it's just a flying saucer". They don't really care why it's there, so why should we? Special Mention - Farewell Hannibal and Parks & Recreation - Sadly, 2015 saw the end to two of my favourite shows ever, both of which went out on a tremendous high. Firstly, Hannibal was cancelled by NBC due to low ratings, but closed its third and final season with the Red Dragon arc, hitting heights of televisual artistry no-one thought it capable of before ending on a heart stopping cliffhanger. Season three never quite hit the heights of the show's phenomenal second year, but even when Hannibal had a weak episode it was still greater than most other shows. This is how you take TV and make it art. If only more people watched. Sigh. Finally, the lovable Parks and Recreation decided to come to a halt after seven years on air. After two enjoyable if uneven consecutive years with seasons five and six, the Parks & Rec gang pulled it all together come the end, delivering arguably the show's greatest season when it really counted. No matter how they did it, I would never have been ready to bid Leslie Knope and her cohort goodbye, but the show's series finale is also its most perfect episode. 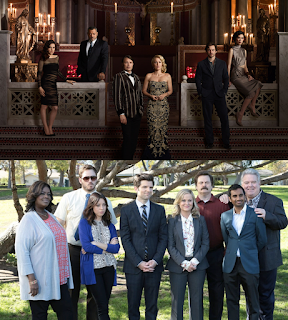 It's sad when two of your favourite shows end for good in the same year, but it's nice to look back and know that both ended on a high.Will Graham, Hannibal Lecter, Leslie Knope and Ron Swanson, I still miss you all.